So anyways, I’m sick in bed today. Not too bad, merely coughing myself into an early grave is all. I have also lost my voice which is a great bonus because it makes me sound so much more pathetic than I actually feel. I have reached the point where I am communicating with my family via a series of squeaks and gestures. The whole thing is actually just comic, and I would pick this any day of the week over any form of stomach bug – even though I may at any moment sprain a rib with coughing. Now that I have over-shared with you about that, you are no doubt wondering why on earth I bring this up. Why shout the news all over the interwebs that I am coughing? I’m just setting the context here. Seeing as I am sitting in bed rather than being productive and planning my Thanksgiving menu, I decided to make some Christmas labels. Every year around this point I’m still feeling optimistic about the whole Christmas package situation. I still have a mental image of all my beautifully wrapped gifts sitting artistically under my perfectly decorated tree. Probably there are little bits of greenery tucked into the ribbons and a fire crackling in my non-existent fireplace. In that beautiful scene I am holding a steaming mug of something lovely, I am thinner, and my hair is cute. My tree is also still fresh and alive rather than crunchily dropping its needles everywhere. However, usually around 10:00 pm on December 23 I come to grips with reality. After the kids are in bed I pull about 3,000 bags out of my closet and start flinging gift wrap at them. My aspirations to beautiful packages have undergone a massive change and I feel that ribbons and bows are total overkill and a waste of time. I’m probably wearing my husband’s hoodie, scrawling people’s names directly onto the paper with a Sharpie, and there is a pine needle stuck to my sock with a piece of tape. If someone mentioned little bits of greenery to me at that moment I would laugh maniacally at them. However. We’re not there yet. The worst has not yet happened. I still have time to get organized and wrap as I go along, not letting the plastic bags pile up in my closet. I have already assembled some of the supplies – I’ve got the giant Costco package of tape, and two of those rhinormous rolls of Costco ribbon. Quite gorgeous ribbon actually. I’m going for Kraft paper this year – brown and white, and it’s sitting here as well. So I decided to make some cute little labels – and theoretically these will adorn my cute little packages. But I figured that as long as I’m doing this I might as well post it here in case anyone else out there is also trying to get a jump on this. These can be printed on adhesive paper, cut out, and stuck onto the gifts, or they could be printed on card stock, hole punched, and tied on with string. I’m probably going to do some of each. I think (think being the operative word) that if you click on the image you should be taken to a page from which you can download it and then do whatever you want with it. I, meanwhile, am going to go make myself another cup of tea and knuckle down to plan my Thanksgiving menu. Great planning ahead, Bekah! The tags are very pretty. Maybe I will actually try to put the tags on the kids’ gifts, and forgo the Sharpie marker…… Wrapping gifts well has never been my forte, and usually I even reuse the ribbons from the kids’ Advent gifts each week. But I’m sorry you’re not feeling well. I hope you feel better soon! May we all be organized and JOYFUL for Christmas…and if not, JOYFUL anyway! Haha! This just inspired me to grab a few gifts and wrap. With a baby due on January 1st and threatening to make her appearance any day now, I probably should get cracking so I don’t end up nursing with one arm and feverishly wrapping on Christmas Eve… or something… 🙂 Last year, I wasn’t pregnant or nursing and my people STILL got their names written ever so nicely in Sharpie on their packages, so I was a good girl and bought labels this year. Thanks for the printables! Hope you are much better soon! Thanks for making me laugh out loud and reminding me I’m not alone in how I want/think things will go, and how they usually pan out. Seriously. This describes me, the last few years, so very, very accurately I can’t even begin to tell you how much I loved reading this. Ahhhh, awesomesauce. Take care of yourself, or, better yet, let your family take care of you! Laughing so hard – your description of Dec. 23rd is exactly what happens at my house! But, you know what? All of my children (now grown) have wonderful memories of all the wild and wonderful preparation activity. No one has ever wished our presents had looked more elegant. Love these! My brilliant wrapping plan this year is to keep the wrapping paper and ribbon in the back of the car, and wrap packages (in the frosty cold, no doubt!) before they make it into the house! Thank you for posting the cute gift tags! 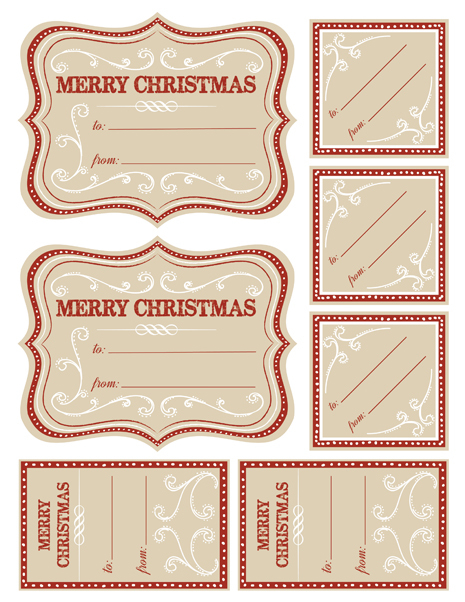 They will look perfect with the Kraft paper (with little white polka dots!) that I found at Target recently. I think I will be a responsible parent and set my children loose with the scissors to cut them all out. Maybe. Thank you so much for sharing! These are fun. Thanks for sharing these! Looking forward to hanging them from my packages this year. I laughed out loud at this too! I have 5 little boys and honestly they don’t care at all if I do or don’t add neat little touches to their packages. I am very familiar with the sharpie on the wrapping paper bit. Actually the last few years I have just been able to find a pencil and kept poking holes through the paper trying to write the names on them! Oh well! As long as I can stay cheery I feel like things are going well. And if I have time after all of the utility work of Christmas is done, then I might do something crafty and creative just to stay in touch with my femininity :0). Thanks for making us laugh! I read this out loud to husband, and he mis-heard “hoodie”–and thought I said “huggie” which he confused in his end-of-the-day-worn-out-ness for “snuggie” which we have come across (to our horror) for sale in Walmart. If you’ve not been unfortunate enough to have spotted these things, here is a link: http://www.mysnuggiestore.com/ We had another laugh imagining you wrapping gifts in your husband’s snuggie. Anyway. We stopped thinking about it, and now afford you proper dignity and realize your husband likely owns no such thing. Hope you’re well again!